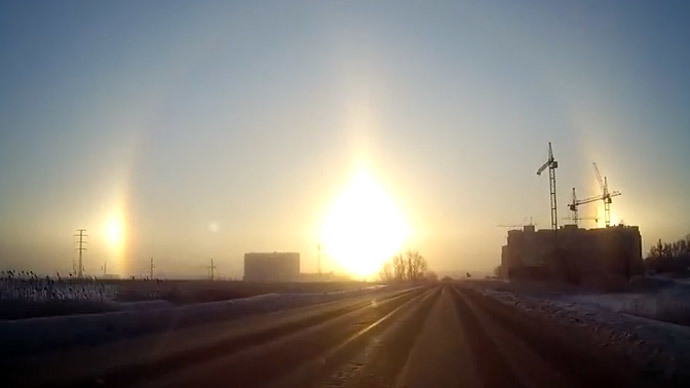 Citizens of Chelyabinsk, near Russia’s Ural mountains, were awed by a rare optical illusion produced by ice crystals in the winter air on Tuesday. While the scientists remained sanguine about the phenomenon, ordinary citizens filled their social media accounts with hundreds of photos of the halo. The illusion is sometimes called a winter rainbow – using ice crystals for refractions, just as the common ones use water droplets. The symmetrical patches of light, tinged with red on the inside, are called mock suns, parhelia or sundogs. On average, such distinct halos are often reported several times a week across the entire globe, and can occur even in relatively mild weather, providing the air several kilometers above is sufficiently cold. A distinct halo was spotted in Yamal in northern Siberia on Tuesday, barely noticeable one was photographed in the eastern Siberian city of Irkutsk, and an impressive one was witnessed in Saskatoon in Canada over the weekend. “The appearance of the halos can vary – from pillars to arcs to circles to blots. It is very hard to predict when all factors will come together for one to appear, but sometimes you can see several in one winter,” said Sheporenko. Documented descriptions date back to the ancient Greeks, and a halo features in William Shakespeare’s Henry VI, where he mentions its appearance ahead of a key battle in the War of the Roses. Across most world cultures, it was regarded as on omen, or harbinger of cold weather - logically, as the crystals above required to create the halo, often descend onto the ground as snow and rain. But Sheporenko says this is not the case this time. “The frosty weather will only last a day or two, and then it will get warmer,” promised the meteorologist. Almost exactly two years ago, on February 15, 2013 Chelyabinsk, a city of 1.1 million people, hit the headlines after a blazing meteor flashed across the sky, after impacting the atmosphere with the strength of over 20 Hiroshima explosions. The 12,000 ton piece of space debris was the biggest object to enter the Earth’s atmosphere since the Tunguska meteor in 1908.